This is such a fun lab for Physics students! I conduct this 2-3 day lab with my Physics students during their sound and waves unit. They need to have a basic understanding of: Standing Waves, Harmonics, Frequency, Pitch, Wave Speed. 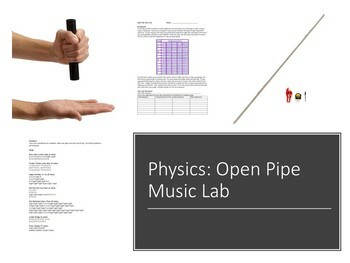 Students will be using their knowledge from their Sound and Waves Unit to create open pipe musical instruments. Students will be split into groups and will choose from a list of basic songs to perform in front of the class. Once, they have chosen their songs (included in lab) they will be begin calculations in creating their one-note PVC pipe instrument. If you purchase, your students are SURE to enjoy!